The best form of self-defense is to be able to identify unsafe situations. If you can be pro-active and know what to look for you can avoid a potentially harmful situation. Sometimes the danger cannot be avoided and you find yourself in harms way. In these times you will be okay because you learned how to protect yourself in our Dojang. You learned how to leverage your strengths and the attackers weaknesses. You understand how to position yourself and how to read the situation. This is because you learned self-defense with Master Gorino. We hope you never need to use the Self-Defense skills you learn at our Dojang. However, if that time comes, you will be prepared. 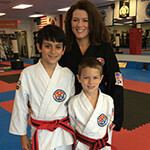 It teaches my son to defend himself, being polite to me and everyone that he knows. It also teaches him to be responsible. 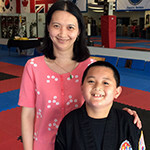 When my son started Tae Kwon Do for the first time, he was scared to attend class as he continued taking class; he felt confident and love it. This motivates him to be the best. It teaches my son to defend himself, being polite to me and everyone that he knows. It also teaches him to be responsible. He even does chores around the house. Now he chooses to go to class instead of staying home playing video games.